Amanuel Mikre believes in creating your own destiny. With the help of Grossmont College – and a deep faith in God – he’s creating his. Mikre speaks from experience. 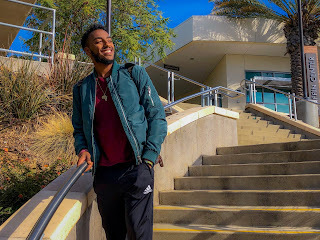 After an aimless first year of community college in Kansas, Mikre moved to San Diego, enrolled at Grossmont, found the support he needed, became a straight-A student, will graduate this spring, and is hoping to transfer this fall to San Diego State University en route to becoming a financial advisor. His accomplishments resulted in Mikre being honored with an Osher Scholarship from the Foundation for Grossmont & Cuyamaca Colleges. It is an award that is well deserved. Mikre’s road to Grossmont College has been a long one. Born the Ethiopian capital of Addis Ababa, Mikre moved when he was 6 years old with his family to the Kansas City suburb of Shawnee, Kan., where his father, a worship director, found a home ministering at the Ethiopian Christian Fellowship Church. Mikre enrolled at Johnson County Community College in neighboring Overland Park, Kan., but Mikre concedes he was not committed to his studies and was placed on academic probation. After a year of missing class and not finding a focus, he withdrew. “At one point in my life I thought I would never finish college because of my weak work ethic at the time,” Mikre said. That changed after his family moved to California in 2016. Mikre resolved not only to return to school, but to excel. While taking a year off for what he calls a ‘mental refresher,’ Mikre, who lives in University City, began researching Grossmont College. He wasn’t disappointed when he enrolled that fall. Finding his way at the El Cajon campus led him to the Umoja program, which provides peer mentoring, counseling, cultural field trips, educational planning, community service opportunities and more. Shortly after involving himself with Umoja, Mikre took part in a statewide conference in Sacramento and was hired as an Umoja ambassador. He also works as a guest services clerk at a La Jolla hotel and volunteers at his church in San Diego. “God is the only reason I am here,” Mikre said. Despite the demands on his time, Mikre’s focus has not wavered. He is determined to become financially independent by the time he’s 35.